We have been eating lots of roast chicken lately. The main ingredient here is cumin. Please ensure that you buy cumin seeds, roast them and freshly grind them for better results and taste. I added some peas and carrots in the last ten minutes of baking. The weather in my small corner of the world is perfect. I now look forward to walking in the mornings. I walked over winter and it was brutal. Have a lovely day my friend. 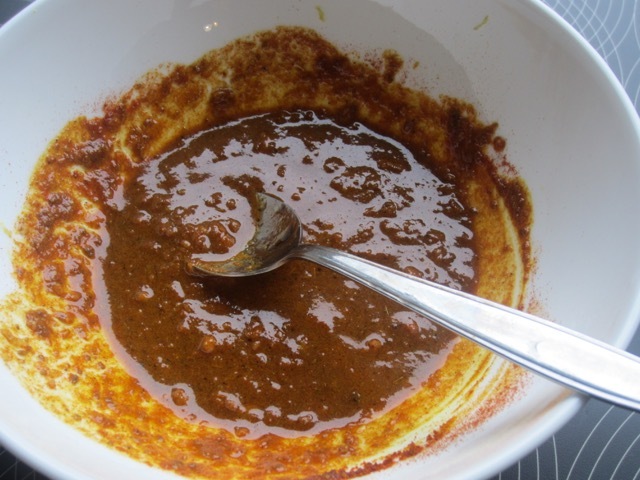 Combine all ingredients for the marinade in a small bowl and mix thoroughly. Season with salt and pepper. 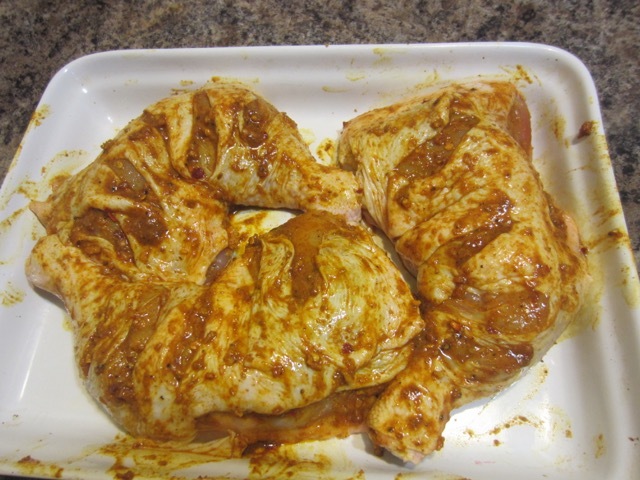 Cut deep slits on each chicken pieces and rub the spice evenly over each chicken, on both sides. Cover and put in the fridge for at least 1 hour or overnight. 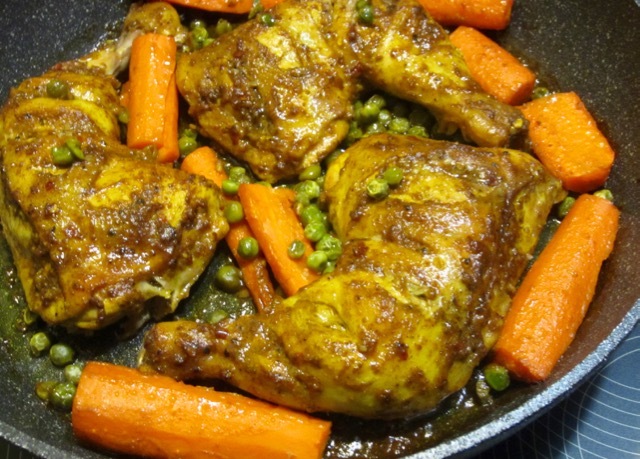 Bake the chicken at 375ºF (190ºC) for 45 minutes to 1 hour or until the chicken is fully cooked. Cut deep slits on each chicken piece and rub the spice evenly over each chicken, on both sides. Serve with some salad and rice or flat bread. You can also BBQ the chicken for 15-20 minutes in a BBQ grill. Cumin: roast cumin seeds in a small pan or skillet until lightly browned (do not burn). Grind with a pestle and mortar or in a spice grinder. Store in an airtight container. I always add some veggies in the last 15-20 minutes of baking. My son too. He adores Indian food! Ooooh I can’t wait for the weather to get perfect on my side of the world too! Soon!! And I completely agree with you about buying the fresh seeds and grinding them yourself, although I buy my seeds already roasted, ooops! I didn’t know you could buy them already roasted. I am so happy winter is over for now. I can’t wait to set out my BBQ. Have a lovely Easter weekend. Hey there Liz, this looks so good! I’m not a big fan of cumin but I’d be willing to give your recipe a “go”! Pre roasting the cumin…..never thought to do that! I’ll let you know how it goes! I’m just back from Orlando and trying to catch up on things including your blog! Glad to hear you are enjoying nice weather! We seem to be under a heavy grey blanket of cloud and rain! You have to give this recipe a go Sandy. I really enjoyed eating the chicken. 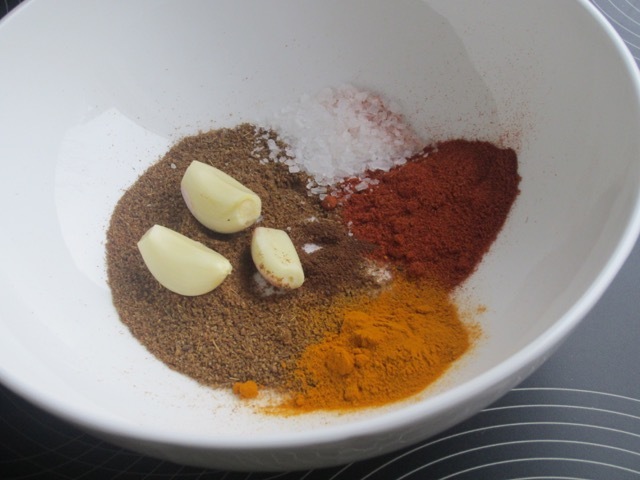 I’ve cooked with Indian spices all my life so I don’t mind cumin at all. Oh Boy Orlando must have been great. I plan to cross the border sometime in July. We shall be having a Basketball tourney. Enjoy the long weekend and welcome back to Canada! Oh oh, I repeated myself about Orlando! My age showing. LOL. I did enjoy the brief break. It was heaven to have sunshine, I even tanned a bit. Went on so many rides at Universal, even an indoor roller coaster. I was tricked on that one. 😳 I’m such a Harry Potter fan, it was my goal to see the Harry Potter World. I enjoyed it along with a gazillion other folks, especially catching the train at either Hogwarts or Hogsmead. GReat video, 3D and some 4D on the rides. I bought myself a Copy of the little owl of Harry’s named Hedwig. It’s actually a puppet that you put your hand inside, it squeaks owl talk and you can turn his head right around! LOL! Have you been to Universal in Orlando? Thank you for the warm welcome back! Nope not yet been to Universal in Orlando. Just watched a few videos on Universal volcano bay and other rides. Looks wonderful. As if you’re in the middle of a fairy tale. Never was much of a Harry Potter fan. Can you imagine I never watched all the movies. My kids watched them over and over and over again. Thanks for letting me know. I shall add it to my bucket list. Enjoy your day! is called Disney rash! Not nice! Sorry about the rash. I hate walking in hot, humid weather. I never do much over summer especially when it’s extremely hot. I hope you’re feeling better! No worries, can’t keep an old dog down! It went away by elevating my foot and drinking more water! I did eat really good food and stayed away from the junk types. Notorious for salt! I had a lovely lemon penne pasta dish with shrimp! Gosh it was good! Now I can’t recall what else was in it! Have you made a dish like this? I might have to experiment a little, sort of a lemony sauce and not sure the cheese, it didn’t take away from the lemon or shrimp….thoughts? It must have been lemon juice and cheese sauce. It tastes really nice. I usually add lemon to 35% cream then throw in some cheese until it melts then drop in my pasta with a good kick of chilli. It tastes so good but is so easy to make. I’ve never done past a with shrimp. I should give it a go!!! Pleasant weekend. I’m sitting with my back to the sun. it’s getting kinda hot now. Take care!